Get cozy with the rustic lodge look of C&F’s Russell quilt set. 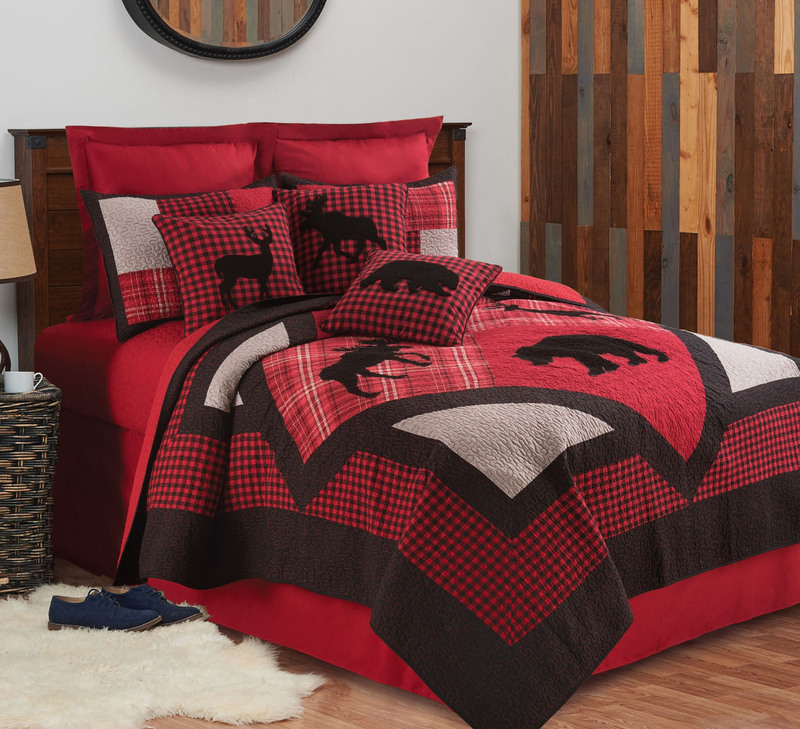 With a border of black and buffalo plaid, Russell has a patchwork centerpiece featuring the silhouette of a moose, bear, deer, and fir tree in soft black corduroy on red plaid and solid red blocks. Fabrics used in the blocks design include solid black, solid gray, a red, black and gray plaid, and buffalo check. The quilting is in a hand-guided vermicelli design using red stitching, which creates added interest all over the quilt. The reverse of the quilt is solid red. The patchwork shams included in the quilt set complete the look with a block design combining all the quilt fabrics. The solid coordinating pattern is Regent Scarlet Matelasse. The included standard shams are in the same fabric as the quilt. Some shown accessories are sold separately Product: Quilt, 2 Standard Shams. Product Measurements: Quilt 90 X 90; Shams 20 X 26. Material: Cotton/Polyester Backing/Blend. Care instructions: machine wash. Maker: imported, made by C & F Enterprises.